Finally, the Mindfulness Skills that have helped millions of adults improve their health, happiness, and relationships have been adapted for children and teens. 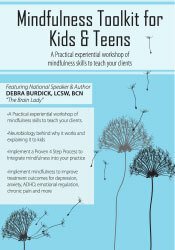 This workshop recording will teach you well established mindfulness skills for helping children and teens improve concentration, emotion regulation, resilience to stress, and positive mind set. You will personally experience the process of doing each of the skills and processing your own results that you can apply to your work with your clients. You will learn a proven 4 step process for integrating Mindfulness into your practice. You will learn the Neurobiology behind Mindfulness and simple ways to explain this to children. The speaker incorporated Mindfulness Skills into her practice with adults and children after she used them to heal from a chronic illness and taught them to her daughter to help with ADHD and sleep. This seminar recording will focus on experiential learning and will include PowerPoint slides, and case examples. Multi-disc DVD recording (6 hours, 13 minutes) with electronic manual and instructions. Debra Burdick, LCSW, BCN, also known as ‘The Brain Lady’, is a Licensed Clinical Social Worker and a board-certified neurofeedback practitioner. Debra is an international speaker and author of the best-selling books, Mindfulness Skills Workbook for Clinicians and Clients: 111 Tools, Techniques, Activities & Worksheets, (PESI, 2013), Mindfulness Skills for Kids & Teens: A Workbook for Clinicians and Clients with 154 Tools, Techniques, Activities and Worksheets (PESI, 2014), ADHD: Non-Medication Treatments and Skills for Children and Teens (PESI, 2015) and Mindfulness Skills for Kids: Card Deck and 3 Card Games (PESI, 2017). She has taught mindfulness skills to her clients for over 25 years. Non-financial: Debra Burdick contributes to SelfGrowth.com and receives no compensation. This self-study course has been approved by PESI, Inc., as a NAADAC Approved Education Provider, for 6.0 CE in the skill group. NAADAC Provider #77553. PESI, Inc. is responsible for all aspects of their programming. Full attendance is required; no partial credit will be awarded for partial attendance.